Doug and Ari, and their respective families had moved temporarily to Phoenix Arizona, to work at the headquarters for the development. Planners and Engineers tend to think differently from each other, (and often they don’t get along), but somehow the integration of the two disciplines resulted in a design and layout for Loreto Bay Resort, that was both, efficient and beautiful. Ari and Doug realized that someday they would like to work together on their own projects. A few years later they both moved their families to Victoria, BC, and did just that. After acquiring design and construction experience in three countries we found an opportunity in the Canadian market for building a company that focuses on transparent partnerships with customers. 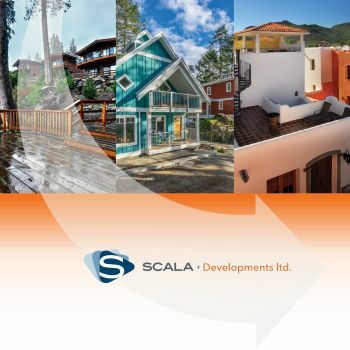 Scala eliminates unnecessary expenses and construction fees and provides value engineered services at fair prices. One of the primary philosophies of Scala is the Integrated Design-Build model (IDB), which allows us to optimize customers’ resources, minimize timelines, and maximize the net value of investments. We believe in building homes that are designed for the families who will live in them. Our home builders are experts in their fields and are constantly innovating processes and home designs to make our homes fit the lifestyles of individual families. Details and customization are essential in every home – including standard homes. Even small changes or adaptations will make a difference in the way the house feels, and reflects the owners’ character and personality. Integrated Design Build (IDB) consists of the owner, architects, engineers, planners, builders, project manager, and subcontractors in ONE open collaboration team. Predictable processes that minimize errors, re-design problems, and change orders. Agreements between architects and engineers, at less operational cost. Efficient communication channels with a single point of contact. Ability to customize sites conditions and as-built drawings if necessary. Efficiency as the result of continuity from the beginning to the end. “Some organizations have been dedicated to developing best practices, credentialing and advancing acceptance of a project fulfillment system that utilizes a unique collaborative model that has consistently been demonstrated to impart a highly efficient and cost-effective means of completing projects on point, on time and on budget”.